I'm spending my summer break getting 1:1 ready. Each and every one of my students will show up for class this fall armed with a brand new, glistening Chromebook. This is happening to me. Me. The great lover of foldables, coloring, cloze notes, and good old fashioned interactive notebooks. But I learned a long time ago that if you don't roll with the punches, you end up with cracked ribs. That's not fun. It makes coughing painful and breathing just plain hard. So my rule is always to roll with those punches--I don't like to hurt. But I'm not abandoning pen and paper and good old-fashioned stuff, oh my. You can read all about my take on this HERE. But as I've said many times, when the digital works best, I'm going with it. It does make my life easier--no copying, cutting, stapling, pasting (I have a headache just mentioning these things). Plus (and arguably most importantly), students need to develop practical technological skills outside of snap-chatting and texting. 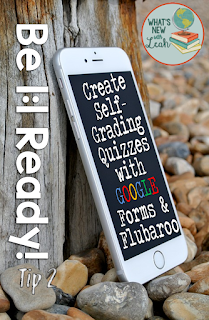 And one time that the digital works best for sure is with creating self-grading quizzes. When I first started using Google Forms to generate quizzes, I learned a code to use in Google Sheets that would make the quizzes self-grading. There were a lot of steps there, and it almost wasn't worth it. But then somebody came up with the free Add-On Flubaroo that does all of that for you. It's super easy. I was sold. First, go to Forms, and create a quiz. If you're a newbie to this, no worries, just check out this video blog to see how to open a Form and create a quiz. The implications for using Forms and Flubaroo as formative assessment are astounding. I've used it to group students and re-group them according to their progress on any specific day. Remediation in small, targeted groups is actually practical now that we don't have to grade everything by hand (as we either forgo sleep or feeding our children dinner that doesn't come with a toy). What are your tips for being 1:1 ready this fall? What would you like to hear more about? Leave a comment below to let me know.